Nearly three hundred highly detailed scaled models built for satisfied clients worldwide. Designers, builders and owners who are involved with Super Yachts competing in the multi million pound sport of ocean yacht racing all agree that a well built scale model of their yacht is highly rated among their multitude of needs for successful sailing. At these events the models attract much attention and are often show stealers with their exact scaled detail being the main topic of conversation. Such models probably receive greater public viewing and comment than known models sighted in museums. So who builds these show stoppers for the well known and famous. One who’s skills are regularly called upon is Essex modeller John Bertola, who in the last 30 years has been commissioned to build nearly 300 Super Yacht models in various scales. Apart from the yacht commissions John is also requested to build other marine models. His records show an impressive, list of names, both of owners and vessels, many of luxurious sea going motor yachts, some newly launched and others well known due to their famous owners. 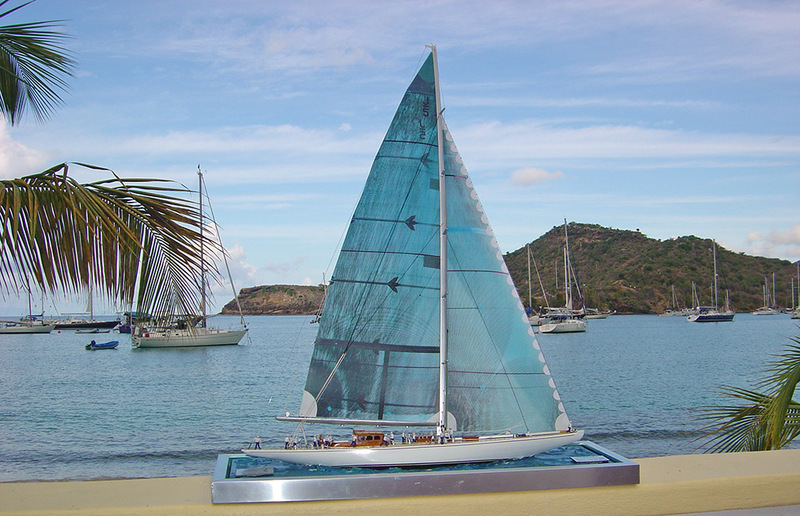 New owners of older vessels often commission work that greatly alters the general appearance of their vessel; stern and bow shapes are sometimes drastically reshaped, all of which can bring good news for John as it normally means the owner commissions another model showing the new arrangement of the prototype. One such was the famous M.V. Kalizma, once owned by the Burtons, Liz and Richard, in their hey-day. Here John had to build a new model showing the stern alterations. The M.Y. Kalizma and many others from the 1920 and 30’s era are sadly missed in choice as good modelling subjects. Many of these vessels have much that provides interesting model work, and building at any of the larger scales allows for some delicate timbered work on decks and handrails to be shown off in natural colours, also with superstructures and interiors that showed the skills of craftsmen who’s work with specialised timbers was second to none. While researching the big sea going luxury yachts, the prospective builder could find himself having to do some real but interesting detective work, as over the years some had name changes and structural alterations that left their shapes differing from when they were launched. I was able to inspect one such model when visiting John’s neat and tidy workshop. The model was of M.Y. Rosenkavalier, whose 217ft prototype was built by Krupps. During its lifetime the old yacht has had a string of wealthy owners from around the world, even the US Navy during wartime. Some of the many owners have left their mark on the Rosenkavalier with alterations that changed her original profile. One very noticeable addition that can be seen in some photographs, was made when she was owned by film producer Robert Stigwood, who in the late 70’s had a second funnel added to house the then latest high tech navigation and communications equipment. 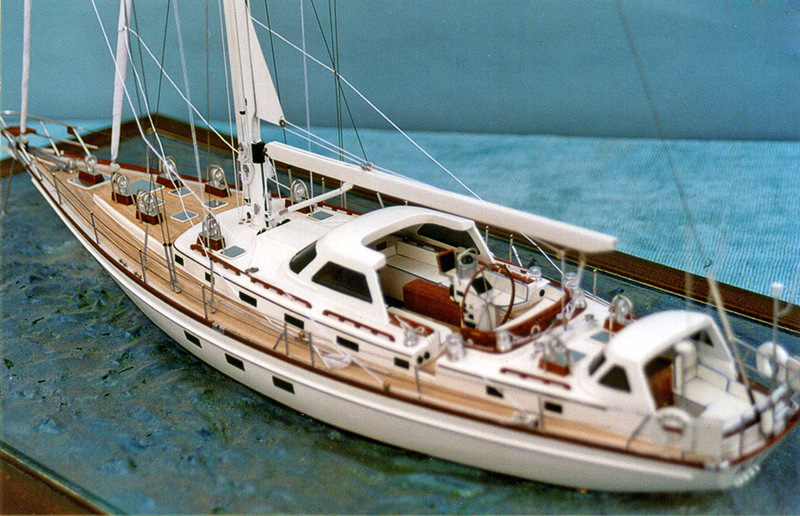 Many of the Super Yacht models John builds are requested as water-line models. He builds the hulls in lasting grp from his own moulds to scales varying from 1:12 down to 1:50. He then calls upon his sailing knowledge to set the completed hull at the correct angle to correspond with wind filled sails. The seascapes John models around the yachts really are works of art and help complete a first class presentation; fusions of blues and greens among the choppy wave pattern, an explosion of bubbling white froth at the bow moulding into smoothed patches along the hull’s length, all giving the impression of a racing yacht running before the wind. Sporting power boats are also frequent subjects on John’s bench; a recent model was of Fabio Buzzi’s Class 1 world championship power boat, and another was Destriero. Italy’s transatlantic power boat fitted with water jet drive systems allowed for some first class detailed work from John. 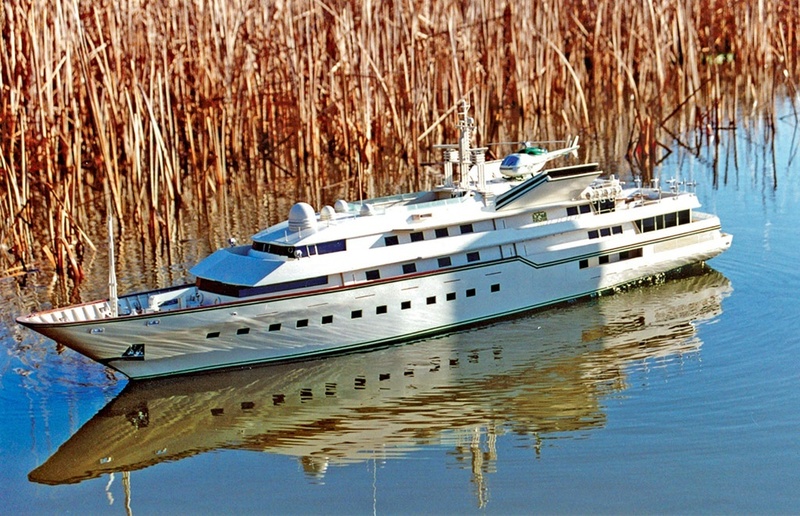 The successful business John has built is still far from affording him a Kalizma yacht, or one of the super ocean racing yachts, but with his now world-wide reputation for good quality work allowing him to capture the best of the Super Yachts in miniature, he looks the contented man.